Bither is a bitcoin wallet solution, available at bither.com that aims to provide cold storage solutions for people interested in bitcoin use. It has managed to design a mobile app for cold/hot storage services that does not use an overly complicated user interface. With the wallet solution provided by Bither, clients that have an account can send and receive bitcoin in a safe environment. The Bither crypto wallet has an open source firmware and uses hierarchical deterministic privacy. In terms of vulnerability to malwares the system had been designed to be immune to that kind of harmful programs. • Android and iOS app, together with a desktop application as well. In this way you avoid the access to your wallet via a web browser, which could have a lower security level. • Bither wallet uses cold storage and also the private keys are stored on the client side. • With the Bither app you can open as many wallets as you wish and each wallet is displayed on the home screen as a series of boxes. By tapping on each one you will then open a new window that will show you a more detail report of all your recent transactions. 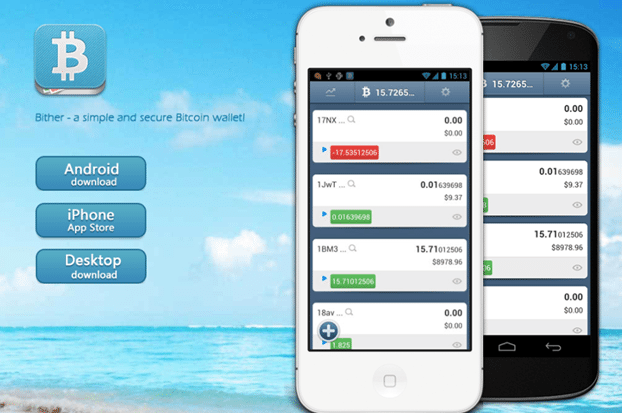 • The wallet app also has a special feature that displays the bitcoin price across 10 different exchanges. • Sending bitcoin from the cold wallet by scanning the recipient QR address code, setting the amount you want to send which creates an unsigned QR code for the transaction. Using this method, you can send bitcoin from the cold wallet to the hot wallet in a secure way. The cold/hot storage system is one of Bither’s main security features, as it is very hard to hack a cold wallet. The app is easy to use by customers and multiple wallets can be created very fast. In terms of the negative aspects, only bitcoin is supported by the platform and the multisig process is discontinued. As a whole, the Bither wallet manages to offer a reliable solution for people that want to store and transact bitcoin in a safe and reliable environment. Summary: Bither is a bitcoin wallet solution, available at bither.com that aims to provide cold storage solutions for people interested in bitcoin use. It has managed to design a mobile app for cold/hot storage services that does not use an overly complicated user interface. With the wallet solution provided by Bither, clients that have an account can send and receive bitcoin in a safe environment.